On 3rd and 3, the #Vikings get a big play. Bridgewater hits Asiata for 22 yards. 23-yard reception is Matt Asiata's longest of the season. 1st down #Vikings . Adrian Peterson up the gut for 21 yards to the #AZCardinals 18. So far offensive coordinator Adrian Peterson has an excellent game plan. 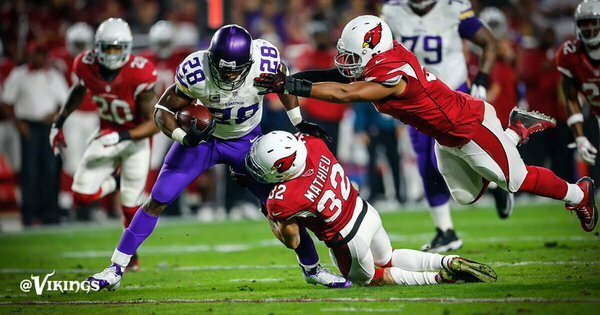 I'm changing my prediction to 47 carries.
.@AdrianPeterson scored his 100th TD of his career, only the 13th running back to do so in NFL history. Adrian Peterson makes it look easy and scores a #Vikings TD from 9-yards. That was a **** You drive by Adrian Peterson, wasn't it? One more stat - with that TD, Adrian ties Barry Sanders for 5th most rushing TDs (95) in first 9 NFL seasons. If Mike Zimmer somehow wins this game, Tracy Claeys should sign his bonus check for going to a bowl over to Zim.
.@teddyb_h2o goes 3-3 for 42 yards on opening drive. 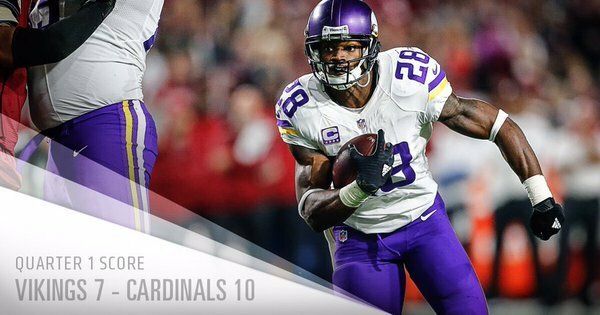 @AdrianPeterson 4 carries, 38 yards and a TD. Vikings lead 7-3 with 3:57 in the 1st Q.
AP so cold man that was crazy. 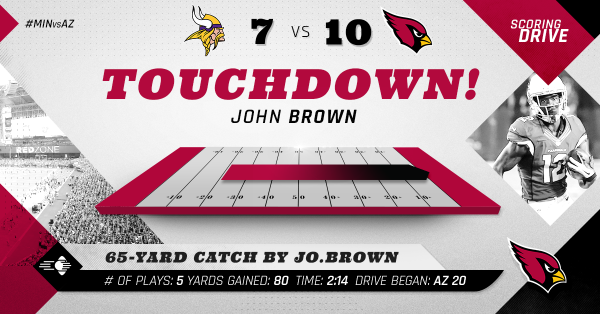 First down John Brown! Palmer hits @Jwalk_back12 for 8 yards. First down at #AZCardinals 35. Holding on right tackle not called? Also, that was Palmer's 30th TD pass of the year, tying Kurt Warner's franchise record for TD passes in a season. Not what I meant by the defense getting off the field? Arizone regains the lead following the touchdown pass and lead 10-7. 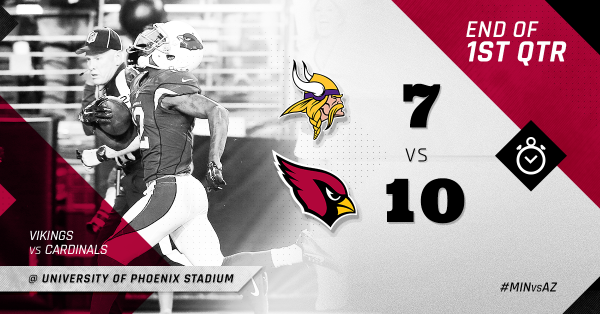 #MINvsAZ . Congratulations on ??? ?TDs, @AdrianPeterson . Carson Palmer's 30 touchdown passes give him as many as Kurt Warner had in the season he led the Cardinals to the Super Bowl. The #AZCardinals force a #Vikings punt and will start this drive on their own 28 leading 10-7. Nice call on 3rd & 9 there, Norv!
. 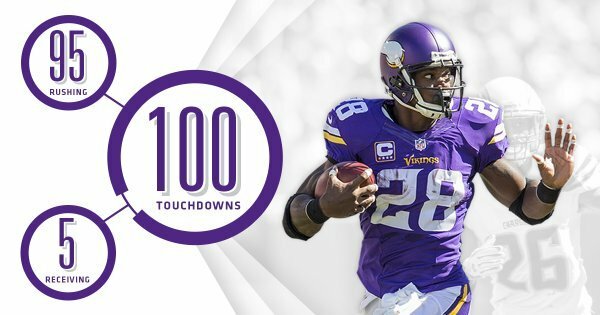 @AdrianPeterson has 1,200+ rushing yards for the 7th time in his career and passed S. Jackson for 17th on the NFL all-time rushing list.